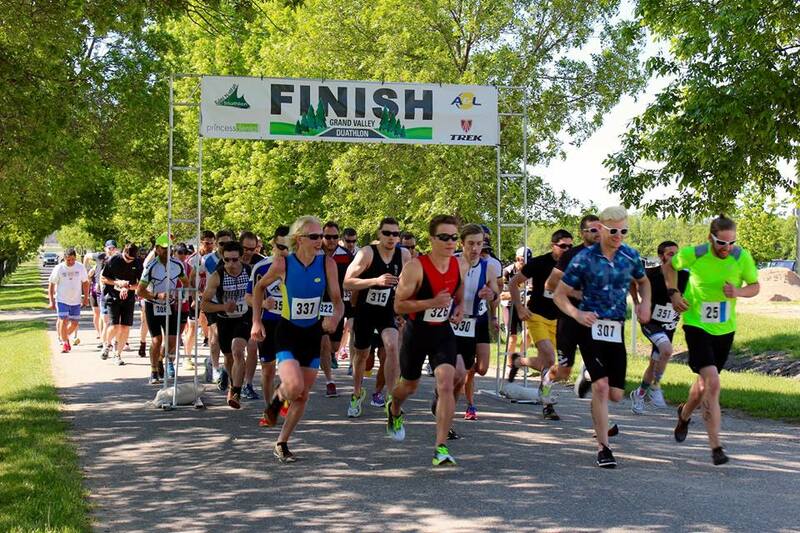 Grand Valley Duathlon was held in Brandon, MB on Sunday, June 5th. 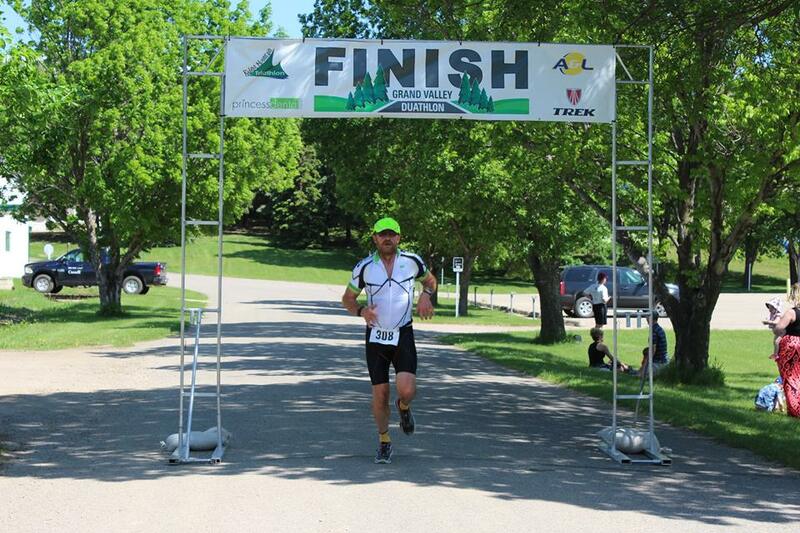 It is a nice season kickoff race for us folks up north where open water still needs another few weeks to warm up. It was a 3km run, 18 km bike and 3 km run event. There was about 80 registered in the event and this ranges from family relay teams to many front line competitors that are part of the local triathlon club. 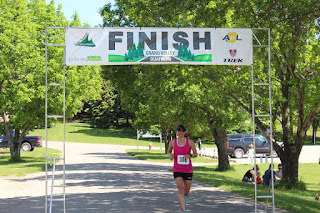 The fee to register is only $40 and though it is a lootless race, there are prizes you can win, a great spread of food and refreshments post race and free pictures available off the sponsor website. There is also free bike check/tune up. Parking is right beside the race event so the vehicle is only steps away. Oatmeal for breakfast, banana and UCAN about 1/2 hour before the race. Only water with Nuun during the race. Both runs are on the same course which is on a pretty nice path and partly shaded. There is 1 huge hill to climb but otherwise is flat. The bike course is an out and back on a quiet highway. The whole event was well organized. Check in was easy, body markings no line ups, nice door prizes and great snacks waiting for us at the finish line. Quick ride on the bike to ensure it was all good and a short warm up run to get things limber. Needed to pee so many times before hitting the start line! It is so frustrating. Even a small, fun event like this gets the nerves rocking a bit. Met up with friends from our community who came out to participate also. 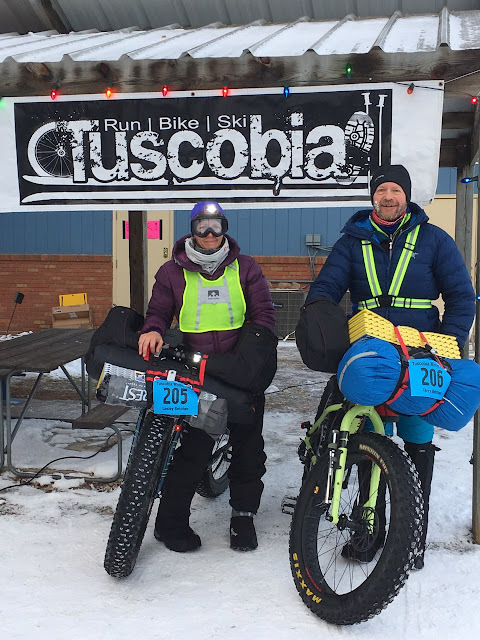 Hubby and I seeded ourselves closer to the front and our plan was to do our best to keep up with the 20 somethings that were toeing the line, ready to take off like a shot. First mile was fast, though I was passed by a few people. All too soon the big hill was upon me and not long after conquering it, I was running into transition. Hubby had come in just before me and I told him to kill it on the bike. Someday, I hope to be able to ride like him! The out part of the bike was straight into the wind. Darn prairie winds! But my goal was to push hard with this short ride to see what was under the hood. The day before had been long ride day (4.5 hours) so I knew my legs wouldn't be fresh but I wanted to push them hard today. It was easy to put the hammer down on the back portion with the wind pushing along. I saw 3 ladies in front of me as I was approaching the turn around. I passed one very quickly but didn't think I could catch up to the other 2, but I sure tried. Back at transition, a quick shoe change and off I went. Wind wasn't as noticeable in the sheltered run course but temperatures were increasing and run was hot. Big hill a bit of a struggle but pushed through. 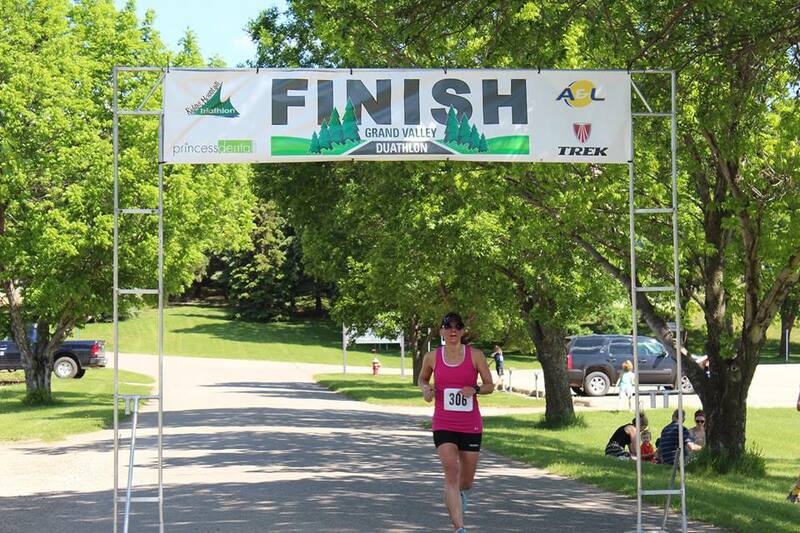 Then there was the finish line. I needed a good cool down walk before finding my husband and getting a snack. Saw I won a door prize which was a nice surprise. Walked over to the finish area to cheer for my friend and her daughter. Packed up, "showered" with our baby wipes, changed and hit the road.